proposed treaty deals with tariffs or trade. While the actual text of the proposed agreement has been kept under wraps, from what has been released, we know that the treaty would preempt environmental protections, food safety and labeling laws, financial regulations and lots more. It would drive up the price of medicines and lead to the off-shoring of jobs. Overall, the TPP would be a boon to transnational corporations and the 1% and hurt the rest of us in numerous ways. 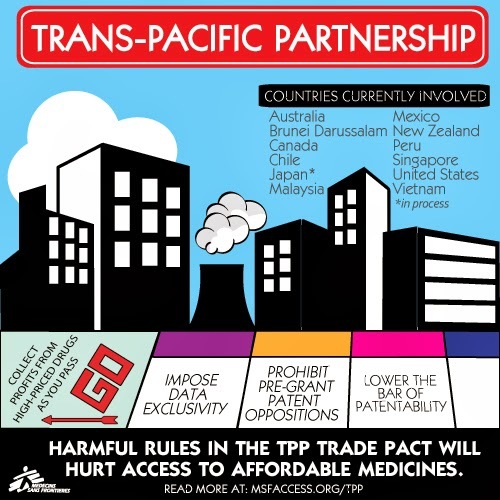 1) Learn more about the TPP. Access an excellent source of info set up by Global Trade Watch by clicking HERE. 2) Let your elected officials know your thoughts. Please note that there is a move to “Fast Track” passage of the TPP. This would prevent proper debate or amendment in Congress and instead allow very limited discussion followed by a straight up or down vote. If you have concerns about the TPP and/or concerns about Fast Track, this is an excellent time to let your U.S. Rep., your Senators and the President know. You can find contact info by clicking HERE.